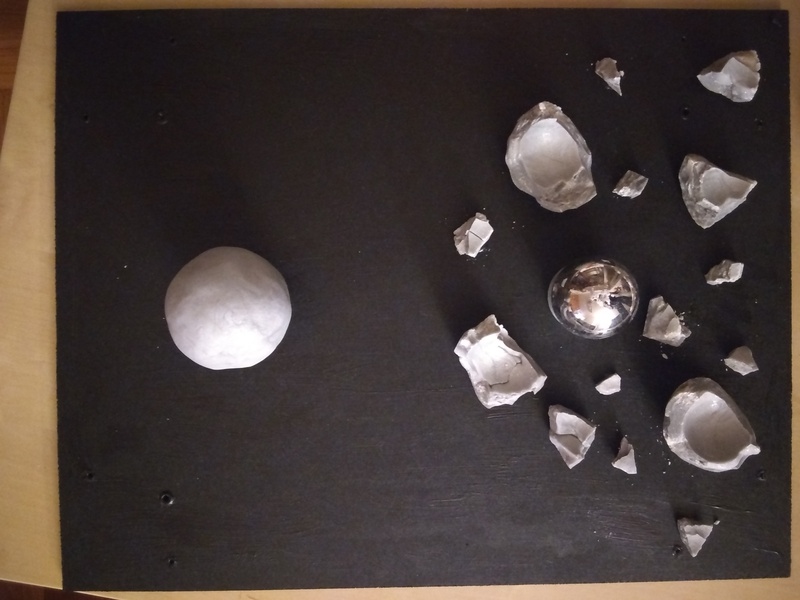 About the work: For this project, I created a model of the Psyche asteroid by wrapping a steel ball in polymer clay. Then I simulated the impact that removed the asteroid’s outer layers by dropping a rock on it. Finally, I arranged the impact fragments and another model in a box to show what it looked like before and after the impact. 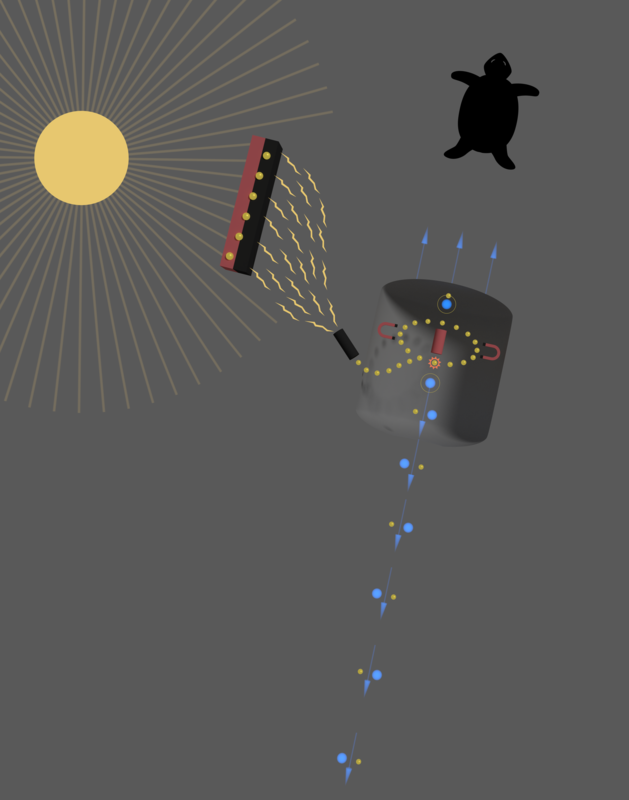 About the work: This image depicts two different types of spacecraft propulsion, through the metaphorical lens of the fable of the Tortoise and the Hare. In that story, told by the ancient Greek storyteller Aesop, the Hare challenges the Tortoise to a race. The Hare’s victory initially seems certain due to its ability to run at high speed. But as the race progresses, the Hare becomes tired and stops to rest. The Tortoise, meanwhile, continues on at low speed. But the Tortoise has an advantage: the Tortoise doesn’t get tired, and manages to overtake the sleeping, stationary Hare. This is one way to think of the different types of propulsion systems that spacecraft can use. 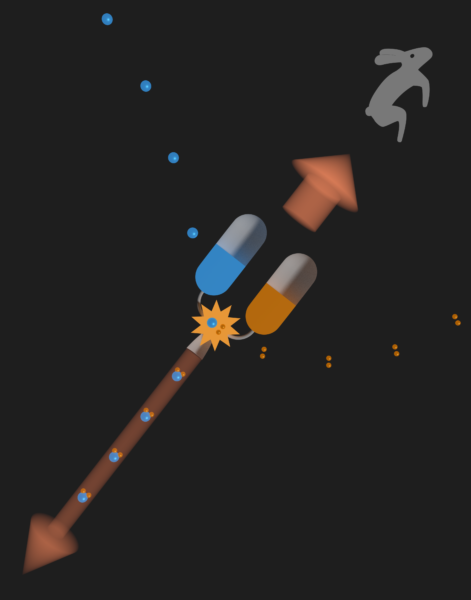 Chemical rockets resemble the Hare: while they can produce massive amounts of thrust, they also are limited in how much fuel they can carry and thus run out of fuel more quickly. A solar-electric propulsion system resembles the Tortoise: while it doesn’t accelerate quickly, it can maintain its tiny acceleration for a long period of time without running out of fuel. You can see how the Psyche spacecraft’s Hall thrusters work by looking at the Tortoise image closely. In the image, electrons are represented by yellow dots. Neutral xenon atoms are represented by blue dots with yellow dots circling them, and xenon ions are represented by blue dots alone. 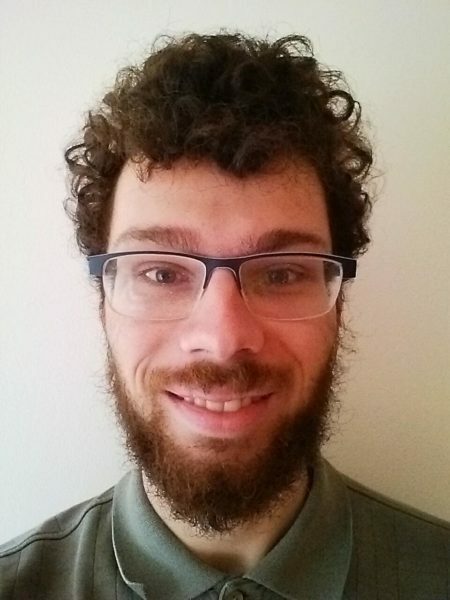 Find out how those particles move the spacecraft by reading the Spacecraft Chief Engineer Dan Goebel’s blog posts Psyche is an SEP Mission and How do the Electronic Thrusters on Psyche Spacecraft Work. Solar panel representation based on information from NASA’s How do Photovoltaics Work? and further data from NASA Ion Propulsion. About the work: The general idea of this piece is to show how all of humanity can create great things together. The rainbows of thoughts flow from people’s minds and join together at the Psyche spacecraft. 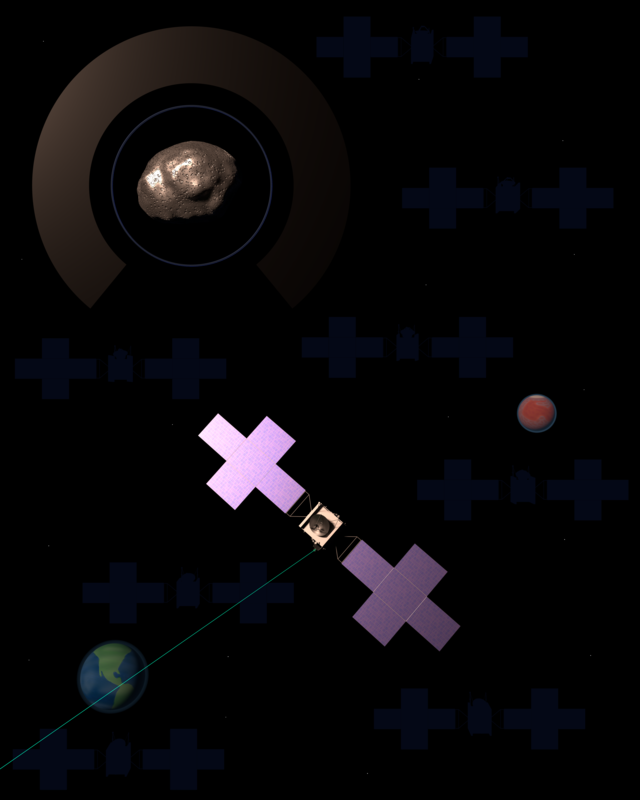 The arc above the spacecraft forms the symbol of the Psyche asteroid. The impact shown between the figures was inspired by the Psyche blog post about mythology—it represents how our experiences affect the things we create. It also represents how we can move beyond destructiveness and instead work together to make new things.